In the San Fermin fiestas, people spend much of their time outdoors. Given the fact that almost all events are held in the open air, the city's streets play a key role in the fiestas. Once the Firework Display has ended, the city's nightlife really gets moving with a whole range of activities. The Old Part of Pamplona is the hub for the nightlife scenario, with its many bars, gastronomical societies and Peñas (San Fermin social clubs). Although it is possible to find all types of people in any part of the city in the San Fermin fiestas, there are a number of zones with more or less defined atmospheres. Within the Old Part a more select atmosphere is to be found in the zone encompassing the Plaza del Castillo square, Cuesta de Labrit street opposite the Bullring and San Nicolás street leading off from the square. The Plaza del Castillo is always packed with people throughout the fiestas. There is a good, lively atmosphere at any time of day or night, but particularly after the bullfight, when the Peñas spread out through the Old Part. At daybreak, people can be found sleeping in the square. The square's bars include: Txoko, Casino Eslava, Baviera, Gure Etxea and the historic Café Iruña. Here, on the terraces, from morning to night, a variety of music can be heard (rock, pop or Basque folk music), drawing together people of all ages. The bars on the Cuesta de Labrit set up terraces on the street, which are generally quite crowded. In general there is a select atmosphere, frequented by important names. On this street there are bars such as Kabiya, Cavas and the Café con Sal. On the streets of San Nicolás, San Gregorio, Comedias, Lindachiquia and Nueva there are a large number of bars, including: Bugales, Ona, Gorriti, Catachú, Noé, Río, Baserri, el Otano, el Marrano and el Museo, this is a popular area with the locals any time of year. Estafeta street is a typical tapas zone. Just before dusk, it is possible to see couples with small children doing a last round before going home, and younger people starting their nightlife with a few drinks and tapas. In this zone, the bars offering tapas include: La Granja, Fitero, Monasterio, Evaristo, Gaucho, Niza, Guria and el Adoquin de la Estafeta. This is a very busy area for pre-lunch tapas and vermouth, and again after the bullfight, in addition to the nightlife which carries on into the early hours of the morning. The riotous atmosphere of the Peñas and the Pamplona locals is centred in the zone of the Jarauta street, and surrounding area: the squares of the Virgen de la O, of Recoletas…This is where most of the Peñas have their premises, with their bands, their revelries and, what's more, where the drinks are cheaper. In the Edificio Singular, opposite the Taconera park in the more modern part of the city, the Singular pub offers films, musical documentaries and musical videos. The pub has been completely refurbished with a modern, minimalist design, and is an after-hours pub for the rest of the year. In the Calderería zone there is a more alternative, liberal atmosphere, particularly with regard to the music played in the bars. This zone includes the streets of San Agustín, Tejería, Navarrería and the zone around the Cathedral. There is an Anglo Saxon atmosphere in the square of the Navarrería with the traditional leap from the Santa Cecilia fountain. In this square there is a traditional bar, the Mesón de la Navarrería, with an atmosphere that is a mixture between Anglo Saxon and Local. Further up, past the Cathedral, stands the Mesón del Caballo Blanco, a very peaceful place, reminiscent of medieval times and offering some excellent views of the area surrounding Pamplona. This is a green area, standing high on the city's ramparts, an area where you can enjoy sitting on the grass and soaking up the magic of this emblematic place..
As the city has gradually expanded outwards, so the revelry has gradually spread to the new districts. 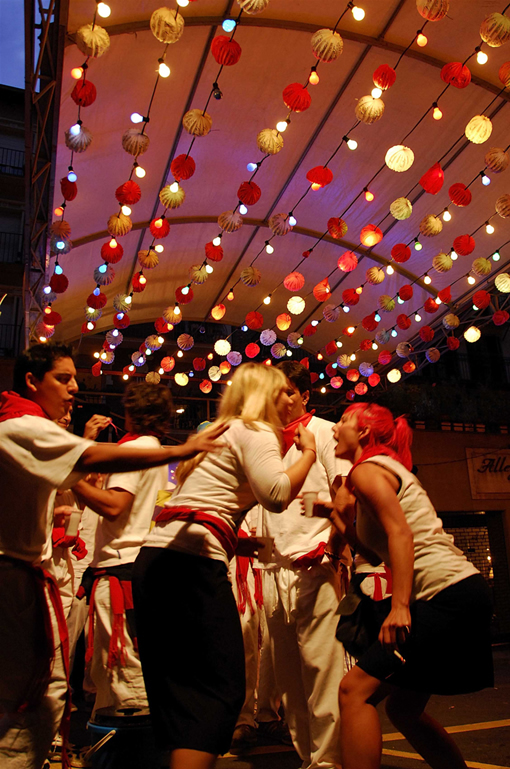 The zones of Iturrama, San Juan and the Yamaguchi Square all have their own nightlife during San Fermines, with a large number of pubs. The atmosphere is generally more peaceful in the Iturrama area, where you can listen to the latest pop and rock music, an area frequented by people in their thirties to fifties. It's a place for a good coffee or evening meal, with quite a number of bars and restaurants. The district of San Juan is a zone with a lot of nightlife throughout the year, with some good tapas bars as well, such as: Charlot, Letyana and El Molino. The zone is renowned for its pubs and some bars with a rock-music atmosphere. There are also a few discos. The Travesía Bayona side street is the busiest part. In the zone of the Plaza de Yamaguchi square, at the end of the Avda. Bayona avenue, there are a group of "in" bars and cafés, and an English style pub, the Gallipot, in addition to the Central and the Pichachilla.